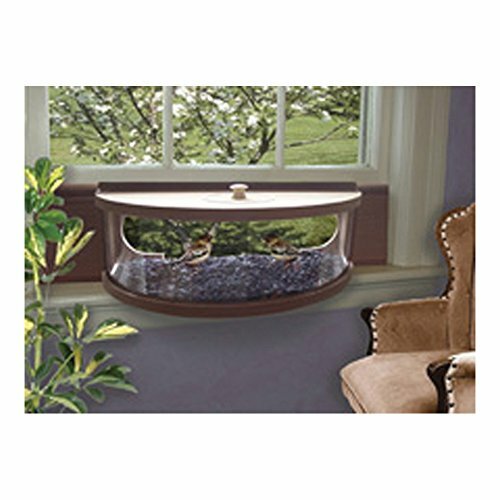 26500 Features: -Brings feeding birds right to your interior windowsill. -Two-way mirrored panels allow you to see the birds up close, yet they can't see you. -Easily mounted in a double-hung window. -Easy to fill and clean from inside your home. -Made in the USA. Country of Manufacture: -United States. Orientation: -Freestanding. Easy Refill Top: -Yes. Color: -Mahogany. Seed Capacity: -0.5 Pounds. Feeder Type: -Window. Dimensions: Overall Height - Top to Bottom: -7.25". Overall Width - Side to Side: -24". Overall Depth - Front to Back: -9". Overall Product Weight: -8 lbs. Easy to fill and clean from inside your home. Feeder fits most double hung windows from 24" to 36" wide. Hand crafted in Maine of plantation grown Mahogany. Warranty: One year. Product Dimensions: 24"W x 7 1/4"H x 9 1/2"D.
Actual Product Weight: 8 lbs. If you have any questions about this product by Coveside, contact us by completing and submitting the form below. If you are looking for a specif part number, please include it with your message. Alessi Water Tower Kitchen Container in Stainless Steel, Mirror Polished with Black Stand10.75"
Alessi Water Tower Kitchen Container in Stainless Steel, Mirror Polished 10.75"